Although they look like muffins to me, Zen Bakery calls these fabulous, high fiber blueberry muffins by the name of "fiber cakes". Perhaps it is because each one contains a whopping 13g of natural fiber which makes them incredibly filling despite their somewhat petite size (they really aren't that small, but compared to the muffins you'd buy at a bakery, they are somewhat small). These fiber cakes make a great breakfast, a great snack, and are particularly wonderful (at only 1 WW point) to eat when you are a hungry, and are looking for something very low calorie or with very few weight watchers points to fill you up. My favorite flavor is Blueberry, but Zen Bakery also makes these fiber cakes in Apple Cranberry as well. 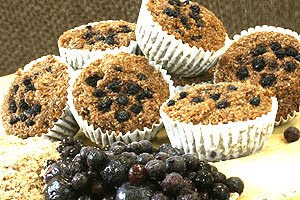 The fiber cakes are made with bran, water, white grape, whole wheat flour, blueberries, sodium bicarbonate, and salt (that is all!). They are totally vegan and despite how sweet they are, they don't have any added sugars. Each muffin has only 80 calories, 1.5 grams of fat, 13 grams of fiber, 5 g of protein, and 1 weight watchers point. They are also very high in iron. Trader Joe's carries these muffins, and the Zen Bakery store locator says that Whole Foods carries them as well (though I've never seen them at my local WF). My only advice is to refrigerate the fiber cakes soon as you get them home. If you leave them out (you'll find them out by the breads at Trader Joe's), they might go bad before you have time to eat all six of them. Luckily, they last a lot longer in the refrigerator. Enjoy your fiber cake muffins! This blog is nice and I liked that.It helps to make us aware of the various types of diet foods which were unknown to me.Thanks again and keep it up. From Georgia: I discovered this site today. .... very informative, and I hope I can find some of the products in this area. Muffins are my favorite desserts and if they are low in calories even better. Blueberries and apples are the best fruits for muffins. Thanks for sharing.